Family can take many forms, and for Fay Robinson, it's the people at the Estacada Community Center. Robinson started volunteering at the center two years ago after the death of her husband. "I was in hospice with him for two years, and my knowledge of this community was limited. (Volunteering) was a way to get my mind off myself and a way to get acquainted with the community," she said. Robinson previously lived in Hawaii and Las Vegas before moving to Estacada 14 years ago. 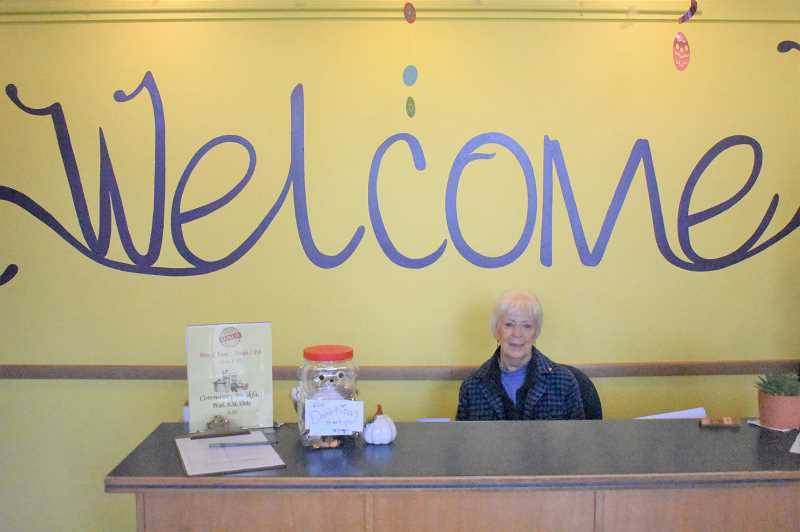 She is involved with several aspects of the Community Center but most frequently works at the front desk, answering phones and welcoming guests to the building. People call the center about "everything," she noted, but some of the most frequent calls are about the Meals on Wheels program. "People ask 'where's my meal?' (They're) really easy to work with and nice," she said. "I take messages, pass them to the appropriate people and try to hit the right button on the phone." Along with working at the front desk several days a week, Robinson also helps in the kitchen during the center's bi-monthly dinner dances. "I like running the dishwasher," she said with a smile. "They all laughed at me, but I said 'I like it.'" For Robinson, a pleasant surprise about her volunteering is the feeling of having an extended family. "I treat it like a second home. I love the warmth from people," she said. "I'm on my own, and sometimes I need someone to talk to. Knowing I can come here and get support, it's a very personal and very necessary thing." She added that the atmosphere is collaborative. "Always, if somebody has an issue we can all work together to solve the issue," she said. She's enjoyed getting to know her fellow volunteers and other faces at the center. "I like being with other people, and sharing stories. Everyone has a story," she continued. As might be expected in an atmosphere that feels like an extended family, all ages are welcome at the center, Robinson noted. "We try to be a community center instead of just a senior center, and get all age groups to participate in activities," she said. Another element of the center she thinks some might be unaware of is that it can be rented for events. "After hours, it's a place to come for large gatherings. That's good to know," she said. She encouraged other potential volunteers to "be prepared for the unexpected." "I started out pulling weeds, but then they needed help inside, so I gradually came inside," she said. Estacada Community Center General Manager Christina Richartz praised Robinson's friendly demeanor. "She greets guests at the door with her warm smile and presence, and that warmth is extended to everyone she interacts with on the phone and in the office," she said. "It is because of folks like Fay, and all of our volunteers that the Community Center continues building a healthy presence in our community." For Robinson, a particularly fun time of year at the Community Center is the holiday season. "We all get together and come in on a day off, and decorate (the building) and have snacks," she said. "I like the camaraderie, and getting things done." Volunteers at the Estacada Community Center help with administrative tasks, events like the center's dinner dances, building maintenance and driving for the Meals on Wheels programs. For more information, call the center at 503-630-7454.